St Kilda Road is a street in Melbourne, Victoria, Australia. It is part of the locality of Melbourne which has the postcode of 3004, and along with Swanston Street forms a major spine of the city. St Kilda Road begins at Flinders Street, in the central business district and crosses Princes Bridge, which spans the Yarra River and connects the central business district of Melbourne with the suburb of St Kilda, ending at Carlisle Street, St Kilda. The road continues as Brighton Road, which becomes Nepean Highway, forming a major arterial connecting the bayside suburbs and Mornington Peninsula to the city. The east side of the road to High Street, Prahran is in the municipality of the City of Melbourne while the west side of the road and the road south of High Street is in the municipality of the City of Port Phillip. The first sale of Crown lands in St. Kilda took place on 7 December 1842. Within a few years, St Kilda became a fashionable area for wealthy settlers, with the high ground above the beach offering a cool fresh breeze during Melbourne's hot summer months. St Kilda Road was a dirt track that linked St Kilda to the town centre. The road was impassable by carriage after rains, which turned the road to mud. Prior to the building of the first bridge spanning the Yarra River in 1844, traffic crossed the river by privately operated punts. In 1844, a privately built wooden trestle toll bridge was built across the river at Swanston Street. In 1850, a government-built sandstone free bridge replaced the wooden bridge. In 1853, the Immigrants' Aid Society established the Immigrant's Home in St Kilda Road, which accommodated 'neglected' and orphaned children and also had a reformatory for children. The Home existed until 1902 when it became the Melbourne Hospital site. In 1854, Kings Domain garden was established. In the same year the government offered four religious groups land on which to build schools. It offered the Wesleyan Methodist Church 10 acres (40,000 m2) facing St Kilda Road. It took a while to find sufficient funds to build the actual school. The foundation stone of Wesley College was laid on 4 January 1865 and the school was officially opened on 11 January 1866. In 1855, the government granted 15 acres (61,000 m2) on St Kilda Road to the Anglican Church on which Melbourne Grammar School was built. The foundation stone was laid on 30 July 1856 and the school was officially opened on 7 April 1858. During the early 1850s, St Kilda Road was the scene of frequent hold-ups by armed bandits and bushrangers which collectively became known as the St Kilda Road robberies. Victoria Barracks were built between 1856 and 1872. In the 1860s, St Kilda was a major bayside resort village. St Kilda Road was a main arterial connecting it with Melbourne, and was planned as a wide European-style boulevard to accommodate horse-drawn traffic. 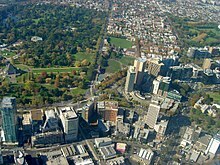 Fawkner Park was created in 1862. In 1865 the government made a grant of land on the corner of St. Kilda Road and High Street, Prahran, to the Victorian Deaf and Dumb Institution (now, the Victorian College for the Deaf), which built a blue-stone building which opened in 1866. The Alfred Hospital was established in 1871. From the 1870s, some of Melbourne's wealthiest residents erected grand mansions on significant lots along the street. In 1877, Cooper and Bailey's Great American International Circus set up on the site of the present Arts Centre. The present Princes Bridge was built in 1888 to replace the 1850 structure, and cable trams commenced running from Swanston Street over the bridge along St Kilda Road to Toorak and St Kilda. At this time, the beautiful elm trees were planted along the road. The Prince Henry's Hospital (originally called the Melbourne Homoeopathic Hospital) was opened in St Kilda Road in 1885, and existed until 1991. Until the end of the 19th century, the Yarra River was subject to regular flooding. A new channel for the Yarra River was dug from 1896 to 1900 to straighten and widen the river. The spoil was used to fill the swampy lagoons and brickmakers pits and raise the height of the river bank where Alexandra Gardens now stands. The Gardens were opened in 1901. In 1901 the Arts Centre site became home to a permanent circus, Olympia, built by the Fitzgerald Brothers' Circus. In 1904, the area of the site not occupied by Fitzgerald's was developed as a fashionable meeting place called Prince's Court. This area featured a Japanese Tea House, open-air theatre, miniature train, water chute and a 15-member military band. In 1907, Wirth Brother's Circus took over the entire site from Fitzgerald's and remained there for the next 50 years. By 1911 they had built a new circus Hippodrome and a roller skating rink, and had leased the original Olympia as a cinema. During World War I some of the buildings were used as nursing homes for soldiers and nurses. During the 1920s a new Green Mill Dance Hall replaced the Jazz Pavilion and Olympia Dancing Palace. In 1925, electric trams along St Kilda Road and the side streets replaced cable trams, and Prince's Bridge was reinforced to take the extra weight of the new trams. The Melbourne Hebrew Congregation opened a 1300-seat synagogue on the corner of Toorak Road in 1930. During the depression of the 1930s, many of the mansions on St Kilda Road were subdivided into units with extensions to the rear of the buildings, resulting in only a few of them remaining today. The Shrine of Remembrance was completed in September 1934. The Repatriation Commission Outpatient Clinic, the only example of an Art Deco building on St Kilda Rd north of Toorak Rd, was opened on 15 November 1937. In the 1950s, an effort was made to introduce higher-density residential living to the area. Housing Commission of Victoria flats, like the Stanhill Flats were erected along nearby Queens Road. In the 1960s, local planning agencies changed the zoning from residential to commercial, in an effort to create more office space for a growing local financial industry. The area was given the postcode 3004, and was allowed to use the title "Melbourne", effectively extending the central business district area. The Green Mill Dance Hall closed in 1950 and the remainder of the Wirth buildings on the Arts Centre site were destroyed by fire in 1953. Much of site was used as an outdoor carpark before construction of the National Gallery of Victoria commenced in the early 1960s. The gallery opened in 1968. In the 1970s, the Victorian government compulsorily acquired much of the land around St Kilda Junction and demolished many of the buildings including the landmark Junction Hotel as part of a street-widening program to accommodate more vehicular traffic. What was once High Street was adjusted to the approximate width of St Kilda Road and renamed to become part of St Kilda Road, effectively extending it to Carlisle Street. An underpass was created under the road to connect Queens Road to Dandenong Road. Construction of the Arts Centre began in 1973 following some delays. 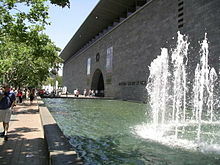 The complex opened in stages, with Hamer Hall opening in 1982, and the Theatres Building opening in 1984. The redevelopment of the Southbank precinct along the Yarra River commenced in 1990 with the construction of the Southbank Promenade. Since the 1980s, heritage controls have protected the few surviving mansions and height limits have been introduced to bring uniformity to the street. On 13 February 2017 St Kilda Rd was included on Australia’s National Heritage List. 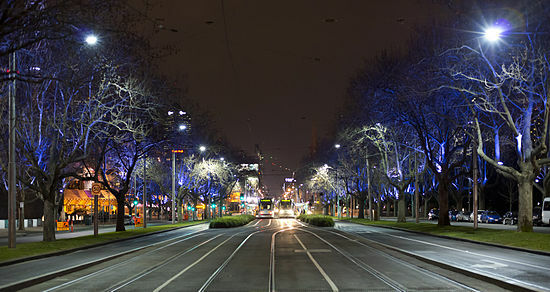 In June 2017, a small number of the elm trees lining St. Kilda Road were cut down for the Melbourne Metro Rail Tunnel project. Today St Kilda Road has been absorbed by the metropolis and the road survives as one of the city's major arteries, flanked by a mix of office, residential and mixed use towers. The street is known for its width and leafiness. For most of its length, the wide street consists of a wide shared footpath (lined with Elm trees), street side parking, a bicycle lane, two lanes for motor vehicle traffic, median strip reserve (lined with mature London Plane trees), another two lanes for motor vehicle traffic and a tram line on either side. Melbourne's trams travel down the centre of the road along the length of the street. There have been proposals for a separated bike lane to be installed. Former Chevron Hotel - now an apartment complex. Tram routes 1, 3, 5, 6,16, 58, 64, 67 and 72 currently run along the road, thus making it the busiest tram corridor in the world. A number of bus routes also run along the road, making it well connected to both the city and surrounding suburbs. Southbank Sunday markets - held outside the Arts Centre. Judith Raphael Buckrich (1996) Melbourne's Grand Boulevard: the Story of St Kilda Road. Published State Library of Victoria. ^ "History of MGS". About Us. Melbourne Grammar School. Archived from the original on 1 May 2008. Retrieved 2 February 2008. 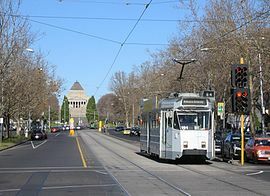 Wikimedia Commons has media related to St Kilda Road, Melbourne.